DETROIT -- Volkswagen AG does not plan to expand its U.S. vehicle lineup beyond what it has announced while it focuses more on the quality of its core products. 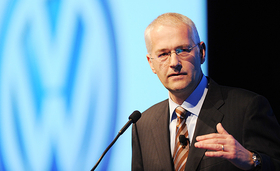 “Somewhere along the way, frankly, we lost our bearings in this market, and we failed to build on that emotional equity and became more of a marginal brand whereas once we had been pioneers,” Jonathan Browning, head of Volkswagen Group of America, said today at the 2011 Automotive News World Congress. He said VW will need to go back and look at the small things it is “tripping over” in the United States, whether pricing, climate control, seat size and/or rear legroom. The German automaker is counting on the Volkswagen Jetta and Passat for expanded U.S. sales. In 2010, VW sold 12,497 Passats, the lowest-volume car in the brand's U.S. lineup except for the Eos convertible. The Jetta was the U.S. sales leader for VW with 123,213 unit sales in 2010, a gain of nearly 14 percent over 2009. Browning said VW saw diesel model sales rise 20 percent in the United States last year and in response will be bringing a diesel version of the redesigned Passat to the U.S. market, although he declined to give a time frame. VW will build the Passat at its new plant in Chattanooga. VW also will be bringing the popular European Golf R to the United States in 2012. Browning said VW will continue selling the Routan minivan in the United States. The vehicle is produced in Chrysler Group's plant in Windsor, Ontario. VW sold 15,961 Routans in the United States last year, up almost 9 percent in an overall market that grew 11 percent over 2009. Volkswagen Group of America's sales jumped 21 percent to 359,889 units from 297,537 in 2009. Audi accounted for 101,629 of the 2010 total. Volkswagen AG is working toward the goal of surpassing Toyota Motor Corp. in size and profitability by 2018. By then, CEO Martin Winterkorn wants to boost VW brand sales in the U.S. market to 800,000 and Audi to 200,000. However, the German automaker's 3.1 percent share of the U.S. market still trails well behind Toyota Motor Sales U.S.A.'s 15.2 percent. Browning, 51, came to VW last June after serving as vice president of global sales for General Motors Co. He was appointed as CEO of Volkswagen Group of America on Oct. 1, filling a two-month vacancy created when Stefan Jacoby went to Volvo Cars.